Our apartment! Here is the plan in all it's less-than-500-square-feet glory! We've been living there for a little over a month and a half, and I can honestly say I love it. The space is small, and we are still trying to get everything organized and put away, but it's really a great apartment. The location is incredible, and our neighbors are so nice (Aubie already got some gifts from the cats on the second floor!). However, I am amazed at how slowly things are coming together...which is partially why I have been hesitant to share anything. When I've lived on my own, I would just get it done as quickly as possible, even if that required some late nights, multiple trips to every store imaginable, and entering into intense DIY mode. But now I think the process of combining our stuff and trying to make decisions together has slowed the pace a bit. At first it drove me crazy, but now I am trying to look at it as investment in the space (of time and money). 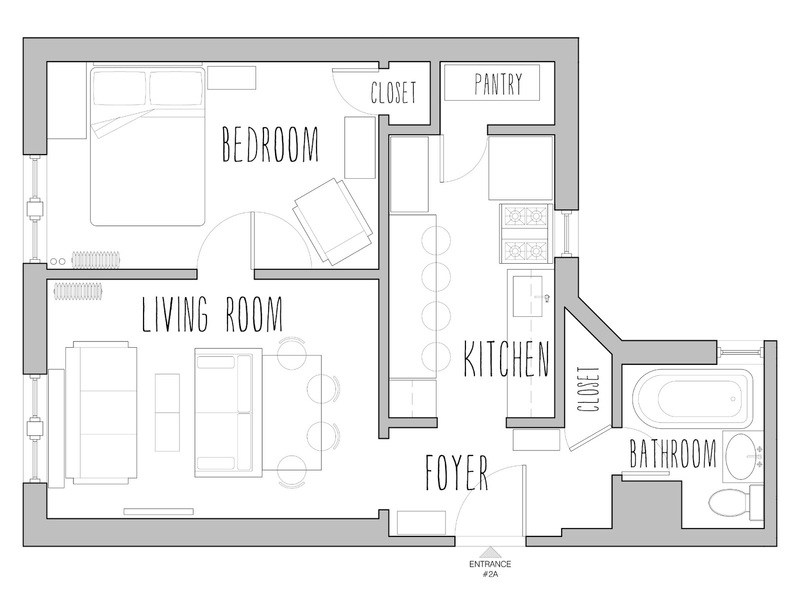 This apartment doesn't feel as transient as the former ones, so I want to get it right. I'm trying to make decisions that can work well for us in the long run and saving up to purchase some pieces we'll really love. Sadly, this means there won't be a rapid fire succession of before/after posts that I love. I'm hoping to get all the things we already own up on the walls or put away in closets and then slowly acquire the rest along the way. No rush...or so I try to tell myself! I can't wait to see photos. I love the layout! I hate to say it but our new place is 2300 sf. Just a tad bigger...But like you said, we are taking it slow too.